If you’re in the market for a new garage door for your home or business or you’re looking to upgrade your existing door, Dr Garage Door Repair Deerfield Beach is here to assist you in finding and installing the door that is right for your needs and that is kind to your budget. 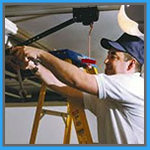 We’ve been in business over 10 years and are experts in fast and efficient garage door installation service. 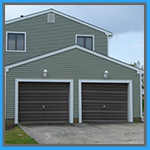 We work with all of the major garage door manufacturers including CHI Overhead doors and Clopay, and we can also custom design a door that will meet your specifications and exceed your expectations. We offer a 100% Money Back Guarantee, so you can rest assured that your new garage door is worth the investment. Call us today! We all now that garage doors aren’t all made the same, nor are the openers. Our expert garage door opener installers are trained in installing any garage door opener, and like the doors themselves, we work with and can service any garage door made by the leading manufacturers. 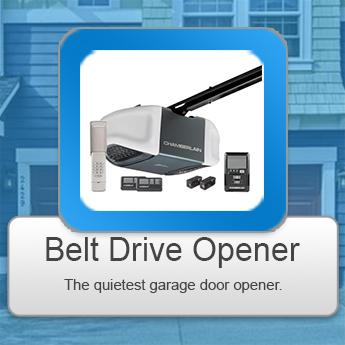 New garage door openers can be opened by associated smartphone apps. If your garage door opener is beyond repair, it’s definitely time to upgrade to a new model! Belt drive openers are great for those who prefer a smooth, quiet operation. Selected models also come with a battery backup just in case the power goes out in your home or business. 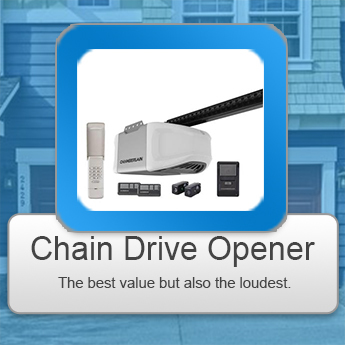 Chain drive openers are the most commonly used opener due to their affordability and their availability in major home improvement outlets. The downside to their popularity is that they do make a lot noise than the other types, so it’s something to consider when making your decision. 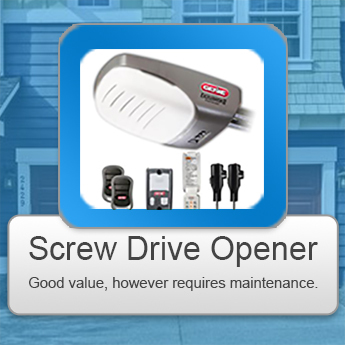 Screw drive garage door openers are terrific because they don’t need as much maintenance. They’re also great when it comes to lifting heavier wooden doors. 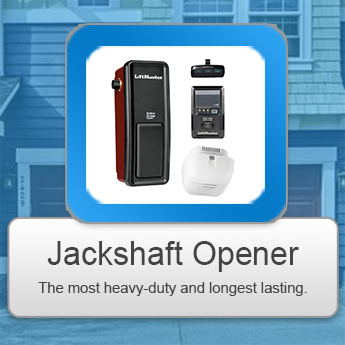 Jackshaft Openers are unlike the rest of the openers which are installed overhead; this opener is mounted on the wall next to the garage door, and they’re extremely useful with garages with low ceilings. Garage door springs are an important part to the lifting of the garage door, creating the tension that you need to lift the door. Without them, due to their weight, they would be impossible to open by yourself. The two types of garage door springs are torsion and extension springs. It’s highly recommended that experienced garage door repairmen fix and install the springs so as to avoid accident or injury.